Three House Democrats won't vote for their own bill to abolish U.S. Immigration and Customs Enforcement if it is brought up for a vote. 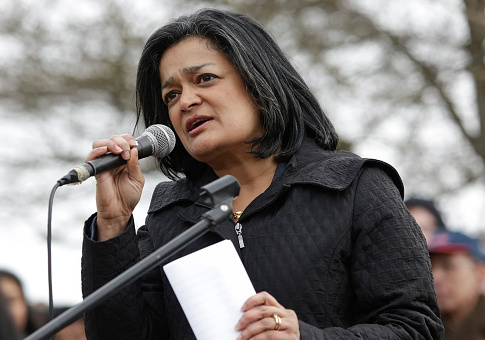 Reps. Mark Pocan (D., Wis.), Pramila Jayapal (D., Wash.) and Adriano Espaillat (D., N.Y.) introduced The Establishing a Humane Immigration Enforcement System Act on Thursday. Republican House leadership announced earlier on Thursday that they would allow the bill to be brought to a vote in order to force members to officially state their position on whether the law enforcement agency, better known as ICE, should be abolished. House Majority Whip Rep. Steve Scalise (R., La.) told The Hill that he strongly was against abolishing ICE but would still bring the bill to a vote. "Democrats have been trying to make July 4th about abolishing ICE, which is a radical, extreme position that would lead to open borders and undermine America's national security," Scalise said. "I think it's the wrong approach. I think everyone ought to be on record about where they stand on that issue." But now, the three representatives say they won't vote for the unamended bill that they introduced. Releasing a joint statement later on Thursday which was obtained by a Vox reporter, they criticized House Speaker Paul Ryan (R., Wis.) by saying he isn't serious about their bill and calling it a "political stunt." "If Speaker Ryan puts our bill on the floor, we plan to vote no and will instead use the opportunity to force an urgently needed and long-overdue conversation on the House floor," the statement said. Republicans believe that bringing the bill to a vote will force Democrats from swing districts into a tough spot. If they vote for the bill, they could alienate moderates, but if they vote against the bill, members of the Democratic Party's liberal base might not be as enthusiastic going into the 2018 midterm elections. This entry was posted in Politics and tagged Adriano Espaillat, House Democrats, House of Representatives, ICE. Bookmark the permalink.